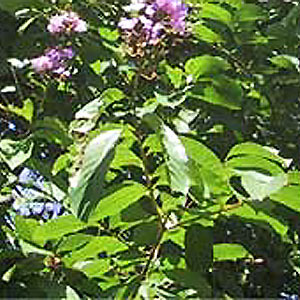 Banaba – Scientific name: Lagerstroemia speciosa Linn. A deciduous tropical flowering tree, 5 to 10 m high, sometimes growing to a height of 20 meters. Leaves, large, spatulate, oblong to elliptic-ovate, 2-4 inches in width, 5-8 inches in length; shedding its leaves the first months of the year. Before shedding, the leaves are bright orange or red during which time it is thought to contain higher levels of corosolic acid). Flowers are racemes, pink to lavender; flowering from March to June. After flowering, the tree bears large clumps of oval nutlike fruits. Grows wild; widely distributed in the Philippines, in the secondary forests at low and medium altitudes. Cultivated for its beautiful flowers. Propagation by seeds. Rich in tannin: fruit, 14 to 17 %; leaves 13 %; bark, 10%. Corrosolic acid is being studied for its glucose lowering effect. – Roots have been used for a variety of stomach ailments. Leaf decoction for diabetes; also use as a diuretic and purgative. – Decoction of old leaves and dried fruit (dried from one to two weeks), 50 gms to a pint of boiling water, 4 to 6 cups daily has been used for diabetes. Old leaves and ripe fruit are preferred, believed to have greater glucose lowering effect. Young leaves and flowers have a similar effect, though only 70% that of matures leaves and fruits. The wood has no known glucose lowering effect; the bark, a very small amount. A decoction of 20 gms of old leaves or dried fruit in 100 cc of water was found to have the equivalent effect to that of 6 to 7.7 units of insulin. – The bark decoction has been used for the treatment of diarrhea. – The bark, flowers and leaves used to facilitiate bowel movements. – Decoction of fruits or roots gargled for aphthous stomatitis. – Decoction of leaves and flowers used for fevers and as diuretic. – Leaf decoction or infusion used for bladder and kidney inflammation, dysuria, and other urinary dysfunctions. Diabetes: Banaba is being studied for its application in the treatment of diabetes. Its ability to lower blood sugar is attributed to its corosolic acid, a triterpenoid glycoside, belived to facilitate glucose-transport into cells. Weight loss: Studies in mice suggest an antiobesity effect. It is becoming a common ingredient in weight-loss supplements / products as a metabolic enhancer. Others: It is also being studied for its use in the treatment of blood pressure, renal and immune system benefits. Studies in mice suggest a lipid lowering effect – decreasing triglyceride and total cholesterol levels. To date, no toxicity has been identified. This entry was posted in List of Medicinal Plants in the Philippines and tagged banaba on March 8, 2009 by Pinoy Herbs. If there isn’t any available, maybe they will find it for you.